Hey there! It's a beautiful Tuesday and I'm here trying my darnedest to convince you to make pasta in the middle of your week. Homemade pasta has such an impressive reputation. If we as much as admit to owning a pasta press the eyes of admiration are sure to bat in our direction. Requirements: Two hands and a pasta press. Qualifications: Play-dough skills must be at a K-5 level. I mean, it's not exactly difficult. It's actually the opposite of difficult, which is defined as "this is why you should just put that frozen pizza back in the case and make ravioli for dinner tonight." I looked it up. As I see it, the only requirement for homemade pasta is a bit of patience. Well, patience, and a pasta press. So, let's dive into this newfound obsession of mine, and talk about how easy it is to make homemade ravioli a weeknight reality. These days I am trying hard to find my weeknight groove and I really love being able to have at least one component of dinner already prepared. I'm not one of those Sunday afternoon meal-preppers though. I have so much respect, but so little energy for that right now. That is why I have been working on making basics, such as marinara or fresh pasta, in large batches, and finding different ways to use them throughout the week. I like to make a big batch of my favorite marinara sauce at the beginning of the week (often while I'm preparing dinner), and keep it on hand for chicken parmesan, pizza night, or ravioli-dipping. It is twenty minutes well spent. There is no "best part" to these ravioli. They are so, so, so ridiculously wonderful that you cannot possibly single out one part. However, the fact that they can be made in large batches and frozen certainly adds to their allure. The pasta dough itself comes together in about twelve minutes and then it has to rest for a half of an hour. While the dough rests, the panko breading and egg wash can be assembled. Rolling out the dough is so satisfying. I used a piping bag to pipe 1 1/2 teaspoon dollops of ricotta onto my pasta sheet. In order to get the spacing just right, I like to stamp the outline of the ravioli press onto the pasta before piping on the ricotta. This gives a template to work within that will really help in keeping things uniform. I learned that air bubbles are a major thing when it comes to ravioli. 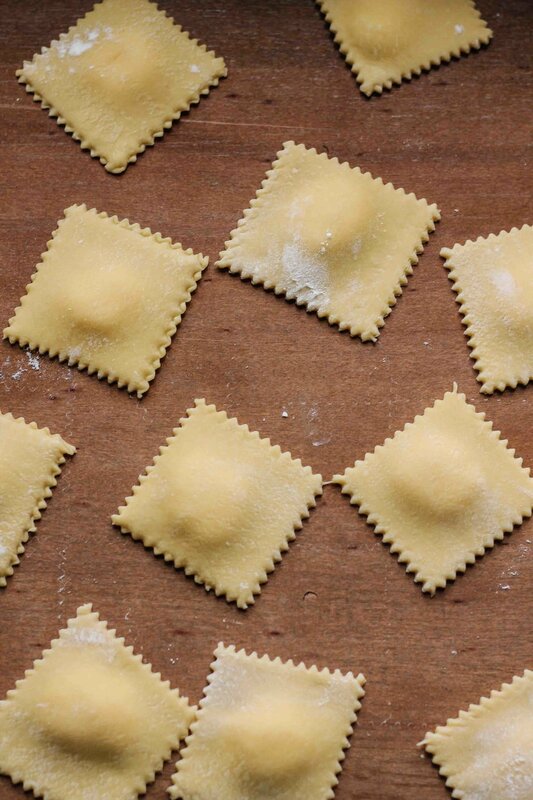 After laying the second sheet of pasta atop the first, you will want to gently press around the ricotta to prevent the ravioli from becoming a pillow of air when you seal it. Now, you can call it a day if you would like. Just lay those frilly squares out onto a baking sheet and freeze for two hours, until solid, and then transfer to an airtight freezer bag. So many possibilities will be at your fingertips. If homemade pasta is impressive, then a freezer stocked with homemade ravioli is amazing. Or, you could freeze only half of your creations, place a big pot of salty water on the stove, and just jump right into the magical world that is fried ravioli. The ravioli are boiled for a brief three minutes before being coated in flour, egg wash, and well-seasoned panko. Then, they are dropped into the fryer to become crisp and golden and wonderful. So, let's step back a moment. With an ample amount of forethought and some minor preparations, nearly every component of this dish can be made in advance. The ravioli can be cooked from frozen, the sauce reheated, and the panko seasoned in advance and stored in an airtight container. Hm. Maybe homemade pasta is pretty impressive after all. The moment you crunch down on one of these chewy, ricotta-stuffed pillows of paradise you will be turning your kitchen into a pasta factory. Quick and easy never tasted so good. In a small, 2-quart saucepan, heat oil over medium high heat. Add the garlic and cook until the garlic just begins to brown, then add tomatoes. Bring the sauce to boil, then reduce heat and simmer for 15 minutes. Remove from heat and transfer to a blender; blend until smooth. Stir in kosher salt and sugar to taste. The amount of sugar will highly depend on the sweetness of the tomatoes. This sauce can be made in advance and stored in the refrigerator for up to two weeks. Turn the flour out unto a large, cleaned section of your countertop and push the flour out to the edges of the mound, forming a wide well. Crack the eggs directly into the center of the well and use a fork to beat the eggs, scooping up a bit of flour from the edges as you work. Continue working the flour into the eggs until a rough dough has formed, then use your hands to shape it into a rough ball. Knead the pasta for ten minutes. This will give your arm quite a workout, but it will result in a lovely, smooth dough. When you are done, the dough should be smooth and firm, but not too sticky or overly dry. Cover the dough with plastic wrap and refrigerate for 30 minutes. Place ricotta in a pastry bag. Flatten the rested dough into a disc and run it through your pasta roller, one time on each setting, until you have reached the third to the last setting. Divide the sheet of pasta into two equal sheets. Take your ravioli stamp and lightly stamp one sheet of the dough so that you have a light outline of the space you will work in. You should be able to do two rows of ravioli. Pipe two rows of ricotta (about 1-1 1/2 teaspoons each) into the center of reach ravioli outline, then cover with the remaining sheet of pasta. Using your fingertips, press lightly around each mound of ricotta to prevent any air bubbles from forming, then use your stamp to punch out 16 even raviolis. Cook’s Note: At this point, you can lay the ravioli out onto a sheet pan and freeze for two hours; until solid. Then, transfer the frozen ravioli to a zip-top bag and store for up to 2 weeks. Line a large baking sheet with paper towels and place a cooling rack on top. In a medium bowl, combine eggs and milk and whisk thoroughly. In a separate bowl, combine panko, garlic powder, onion powder, and dried spices. Place the flour in a third bowl. Set a large pot of water over high heat and season with salt. When the water is boiling, drop ravioli and boil for 3 minutes; drain immediately. Dip the still-hot ravioli in flour and shake to dust off the excess. Dip in egg wash and then coat with the seasoned panko. Lay the coated ravioli on a drying rack. Fill your deep fryer with 3-inches of vegetable oil and heat until it has reached 350 degrees F.
Drop the ravioli in the hot oil, working two at a time, and fry for one minute on each side. 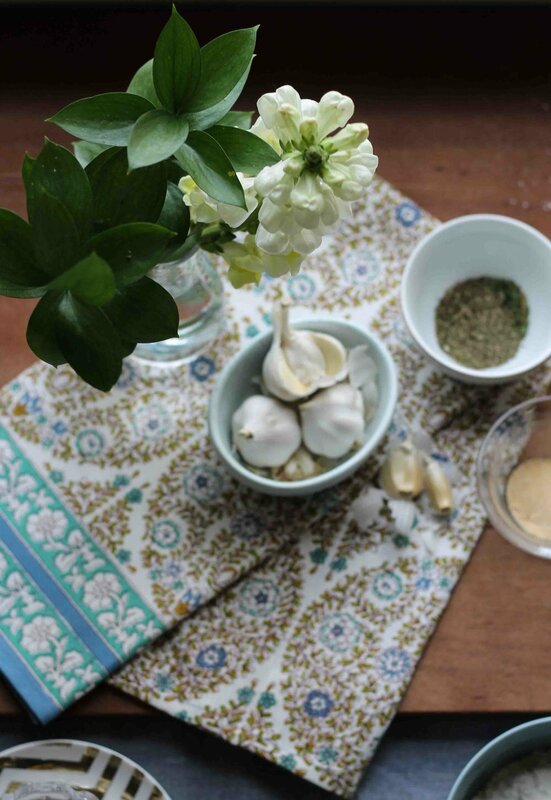 Transfer the ravioli to the prepared cooling rack and sprinkle with sea salt immediately after frying. Allow the ravioli to cool for five minutes before serving. Serve alongside hot marinara sauce for dipping. Enjoy!